RCR (River & Canal Rescue) is the boating equivalent of the AA. Luckily we are members as the rudder problems could not be resolved. So I gave RCR a ring and their subbie from Bronte Boats in Hebden Bridge rang me back in 10 minutes. 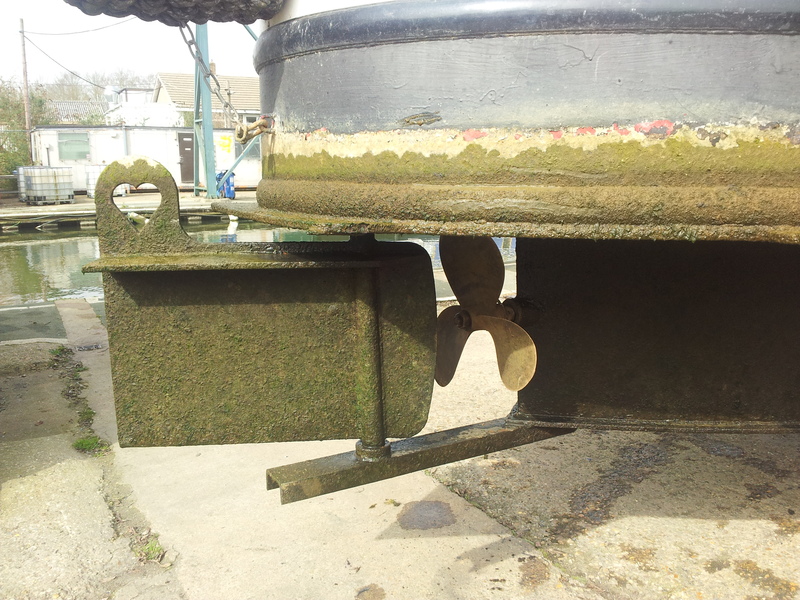 He said it sounded like the skeg was bent (the skeg is the sticky out bit that the rudder sits on) and we would need to come out of the water to get it fixed. Or it might be that the rudder had been displaced from the cup it sits in and if that was the case then he might be able to fix it. Here is a photo taken earlier in the year. So we were hoping for the latter scenario. He turned up a couple of hours later, put on a dry suit and got into the water up to above his chest. Luckily for us the rudder had come out of the cup and within half an hour he had it relocated. So we got on our way at about 12:30 and carried on down the Calder and Hebble. Most of the locks were as short as the one we had problems with yesterday so we were extra careful. Occasionally we came across longer locks, luxury! Longer locks means that I get a better view and can sit on the dinette to watch. It’s still exhausting though, so much of the time I spent asleep. We got to Wakefield in the late afternoon having passed a shirt factory where Pip had in the past done some set painting work for Wakefield Theatre. Yes a strange workshop. Then we made a sharp right turn having nearly come head to head with another boat. 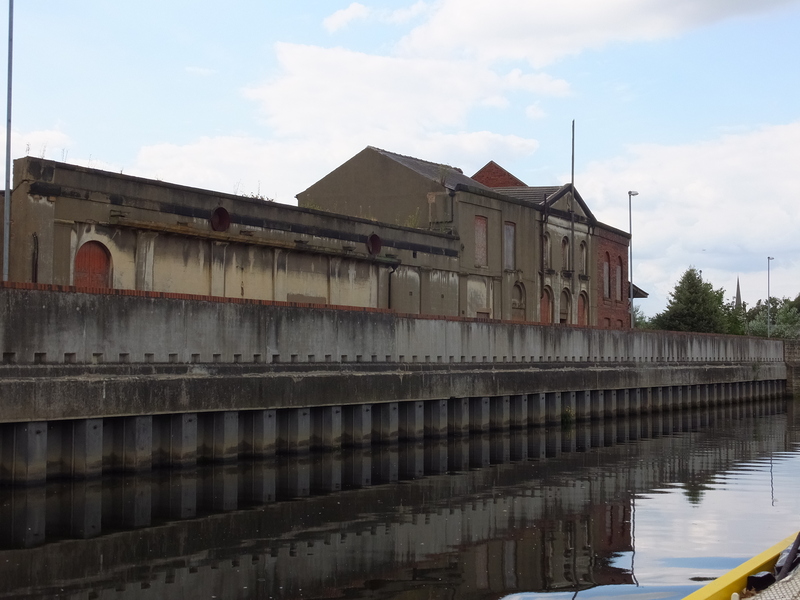 Turning off the River Calder onto an artificial cut. 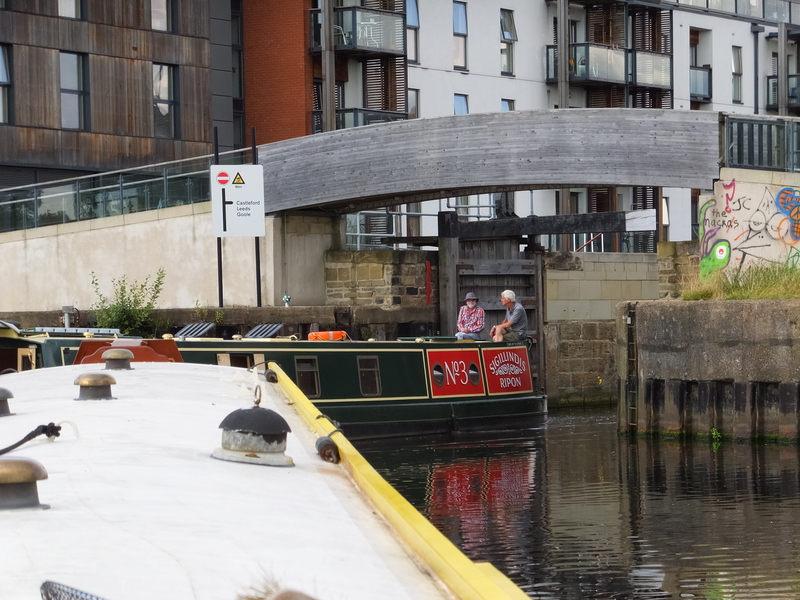 The next lock was Fall Ing lock which is the start of the Aire and Calder Navigation. This lock was huge we could have fitted two Lillians in lengthways if we had wanted plus another two alongside. We then carried on another couple of miles to Stanley Ferry and moored up for the night on what were signed as “Long Term Moorings” but nobody was around who bothered. We fired up the barbecue and had a very pleasant evening sitting on the bank. They had a pleasant evening on the bank whilst I, with my fur coat, sat all alone watching them from the boat. Not fair! Especially as they had Salmon! This entry was posted in Uncategorized on 30th Jul 2014 by pipandmick. I’ve enjoyed reading about your travels on ‘my’ canals- Rochdale, Calder & Hebble etc. Most of the canal blogs are cruising in the South. But Up North we have space, guys, lots of space! I can walk for days on the towpath and not see a boat moving. Darn South is bloomin hectic in comparison.